Gray painted wall sconce is easy to match every house. IP54 makes it suitable for indoor and outdoor usage. You need to prepare two E27 bulbs by yourself because bulbs are not included. If you have any questions about the order or the usage, welcome to contact us, we will provide the best solution for you. More products, please click the ALHAKIN below the title. 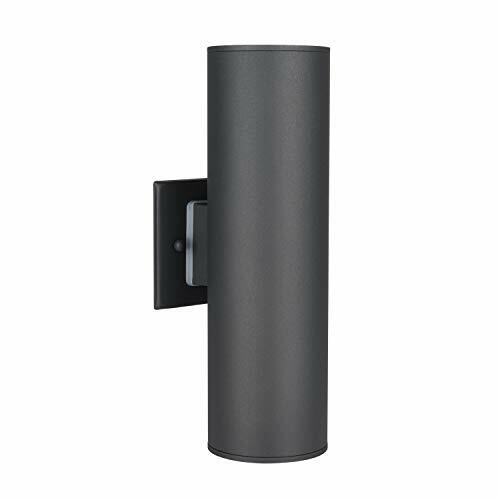 Two-Light Outdoor Wall Light - Simple Exterior and Well-constructed. Up/Down Wall Lamp - IP54 Waterproof, Weather proof & Rust resistant. Made of Stainless Steel 304, Painted Gray, High Quality, UL Listed. Bulb Base - E26/E27(60-watt maximum), 2 bulbs are not included. Perfect for garden, corridor, patio,balcony, villa, walkway outdoor lighting.